In the Neurons and Synapses unit you will learn that the nervous system consists of the central nervous system (CNS) and the peripheral nerves. It is composed of cells called neurons that can carry rapid electrical impulses. There are two types of neurons: sensory neurons which carry nerve impulses from sense organs to the central nervous system and motor neurons which carry nerve impulses from the central nervous system to effectors which produce the response. Within the CNS the impulses are carried by relay neurons. Figure 1 below illustrates a structure of the motor neuron. Neurons transmit the message, synapses modulate the message. Professor Scott Waddell – genetics, molecular biology and neurobiology. Compare the speed of nerve impulse conduction myelinated and non-myelinated neurons. 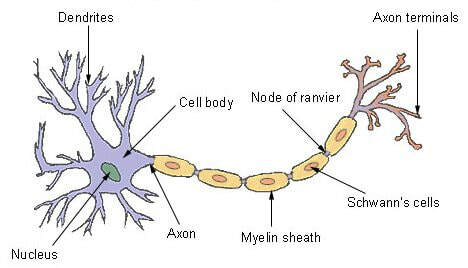 Nerve fibres conduct electrical impulses along the length of their axons. Some of these axons such as interneurons are unmyelinated, and therefore the impulse travels much slower. 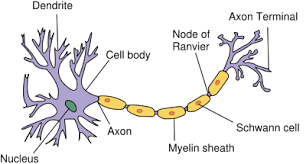 Some axons are surrounded by a mixture of protein and phospholipids called myelin that collectively form a myelin sheath. The greater the diameter, the greater the speed of the nerve impulse. ​When a neuron is inactive, there is an imbalance of positive and negative charges across its membrane. This results in a potential called the resting potential. 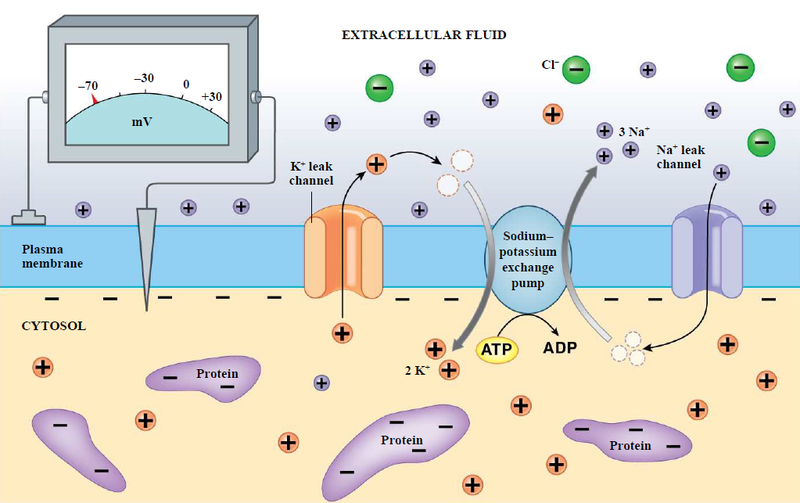 To create this potential, sodium-potassium pumps transfers Na+ ions out of the cell and K+ ions in with a 3:2 ratio. This creates a charge imbalance across the membrane of approximately -70 mV. The time period when a neuron that is not conducting a nerve impulse, but is ready to conduct one, is called the resting potential. The arrival of an action potential caused by a stimulus causes a depolarization of the membrane as Na+ channels begin to open. 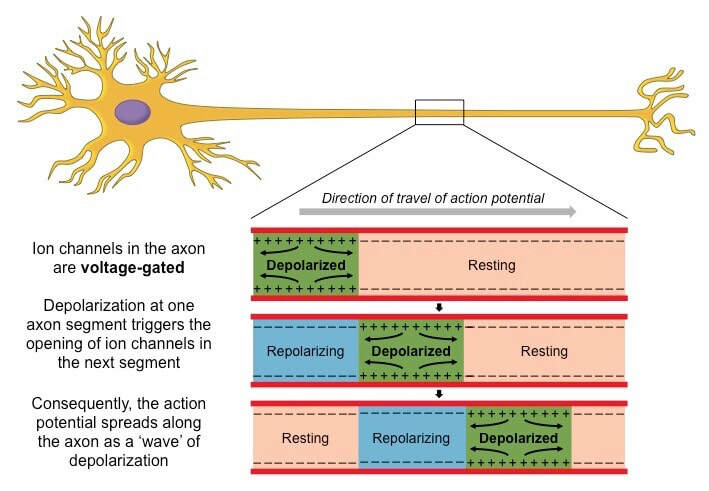 As a depolarization occurs in one part of the neuron, the positive charge triggers the Na+ channels to open in the nearby regions causing an action potential to occur. This action potential will cause a depolarization in the next region. 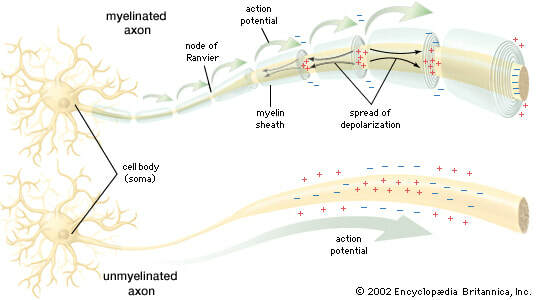 The propagation of action potentials will continue along the axon of the neuron. These local currents causes the adjacent region to become more positively charged. State the role of neurotransmitters. As the nerve impulse reaches the axon terminal of the presynaptic neuron, thepositive charge from the depolarization causes voltage-gated channels permeable to Ca2+ to open. Ca2+ flows into the presynaptic neuron increasing the amount of Ca2+ in the presynaptic neuron. 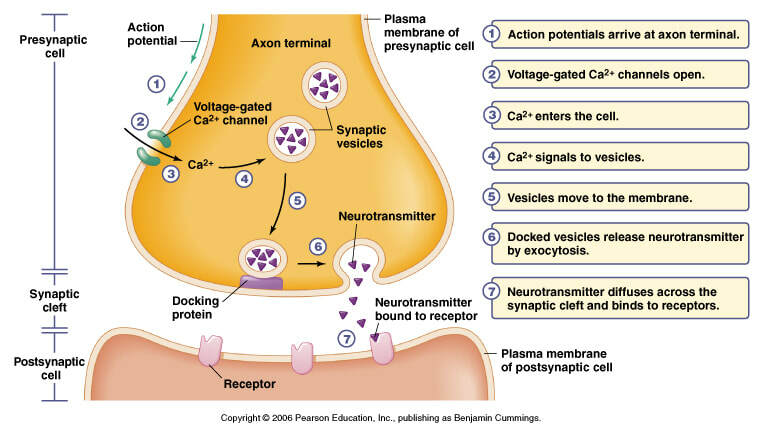 This Ca2+ causes vesicles containing neurotransmitters to bind to the membrane and release their neurotransmitters into the synaptic cleft (space between pre and post synaptic neuron). 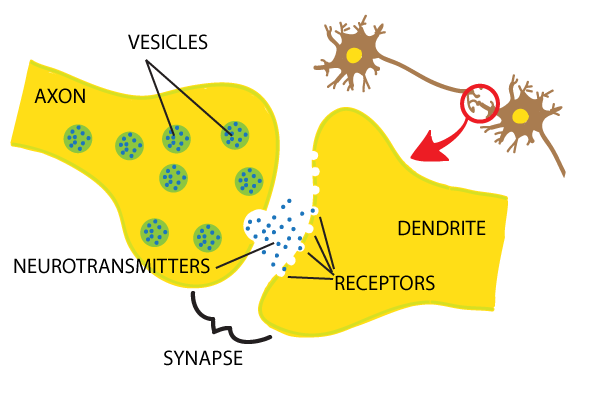 These neurotransmitters diffuse across the synaptic cleft and bind to receptor sites on the membrane of the post synaptic neuron. The binding of these neurotransmitters open ion channels allowing ions such as Na+ to diffuse into the post synaptic neuron. This influx of positive charge possibly leads to an action potential and adepolarization in the post synaptic neuron. The neurotransmitter is reabsorbed by the presynaptic neuron or broken down in the synapse by enzymes. Typical post-synaptic neuron in the brain has synapses with many pre-synaptic neurons. This may be necessary for several of these to release neurotransmitter at same time for threshold potential to be reached and nerve impulse to be initiated in post-synaptic neuron (helps in decision making). State why neonicotinoids insecticides are not highly toxic to humans. Outline the use of oscilloscopes in measuring membrane potential. Oscilloscopes can be used to measure the membrane potential of a neuron region over time by placing an electrode on each side of the membrane. 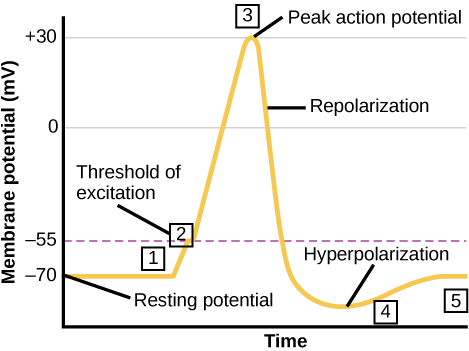 As shown below, before an action potential occurs, the potential is at the resting value of -70mv. Then it spikes to +30 as the action potential passes and returns to the resting value after repolorization. Reflex arc animation from msjensen. ​Hank begins a series of videos on organ systems with a look at the nervous system and all of the things that it is responsible for in the body. ​Paul Andersen begins this podcast with a discussion of brain lateralization and gives a brief demonstration of tests that were performed on split-brain individuals. He then discusses the major parts of a neuron and explains how action potentials are generated using voltage-gated ion channels. He explains how neurotransmitters transmit messages across a synapse and how these messages can be either inhibitory or excitatory. ​In my 2-Minute Neuroscience videos I explain neuroscience topics in 2 minutes or less. In this video, I discuss the action potential. 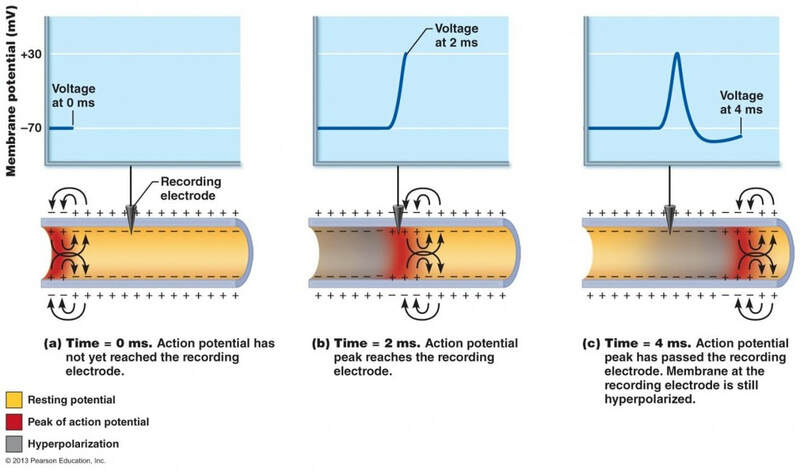 The term "action potential" refers to the electrical signaling that occurs within neurons. This electrical signaling leads the release of neurotransmitters, and therefore is important to the chemical communication that occurs between neurons. Thus, understanding the action potential is important to understanding how neurons communicate. In my 2-Minute Neuroscience videos I explain neuroscience topics in 2 minutes or less. In this video, I discuss synaptic transmission. I describe the synapse, synaptic cleft, release of neurotransmitter and its interaction with receptors, and the ways neurotransmitter is cleared from the synaptic cleft. Dr. Chiaravalloti discusses the learning process and techniques that have been shown to improve learning and memory in healthy persons. She walks through the evidence demonstrating these techniques to additionally be helpful to persons with Multiple Sclerosis and Traumatic Brain Injury.